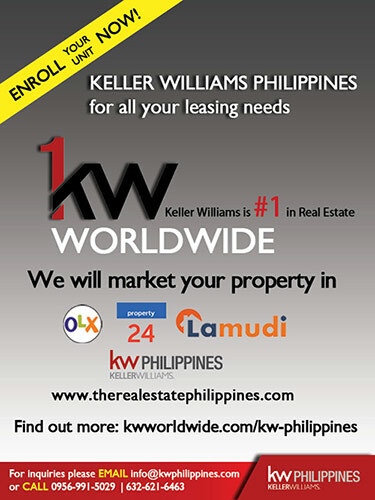 Pro-Excel, the leasing and property management company handling Filinvest residential units has decided to focus on its core business of property management and has recently endorsed Keller Williams Philippines to handle the leasing requirements of the different Filinvest communities. Keller Williams Philippines is a franchise of Keller Williams Realty Inc., the number 1 real estate company with 180,000 agents in 900 market centers worldwide. Keller Williams is also described as a training company that happens to be in the real estate business. Keller Williams Philippines opened its doors to the market on July 1, 2017 and currently has 7 market centers in the Philippines and is continuously growing its presence nationwide. The Pro-Excel announcement was made last November with the effectivity of the endorsement on November 15, 2018. Unit owners with existing leasing contracts will remain valid until the end of the said contract. After which, they may contact Ms. Bernadette Haider, General Manager of Keller Williams Philippines at (632) 6216463, 63956 9915029 or email bernadette.haider for their leasing requirements.